There is a saying in Italian “Cu si marita e cuntentu nu iornu, cu mmazza nu porcu e cuntentu n’annu” – Marriage gives you happiness for one night, but the pig gives you happiness for a whole year. There must be more recipes for salami and sausages than there are Italians on this planet, and every Italian is convinced that his / hers is the best. My believe is, as with all my cooking, that the simple recipes, using very good quality ingredients, are the best, allowing the enjoyment of the foods without having to camouflage it with unnecessary ingredients and processes. 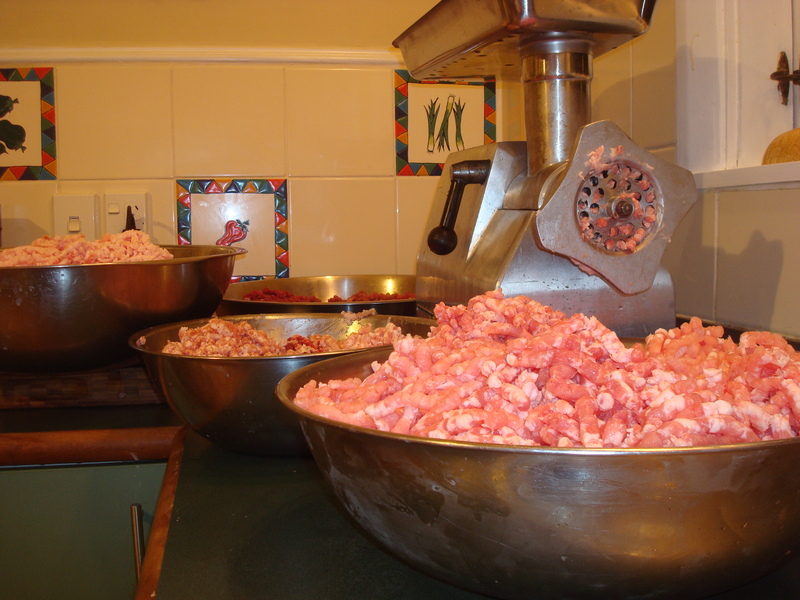 Sausage and salami making is one of my great passions which I practiced for many a year. Traditionally the pig is killed once a year and every bit of the pig is used and the saying is that only the toenails are discarded. 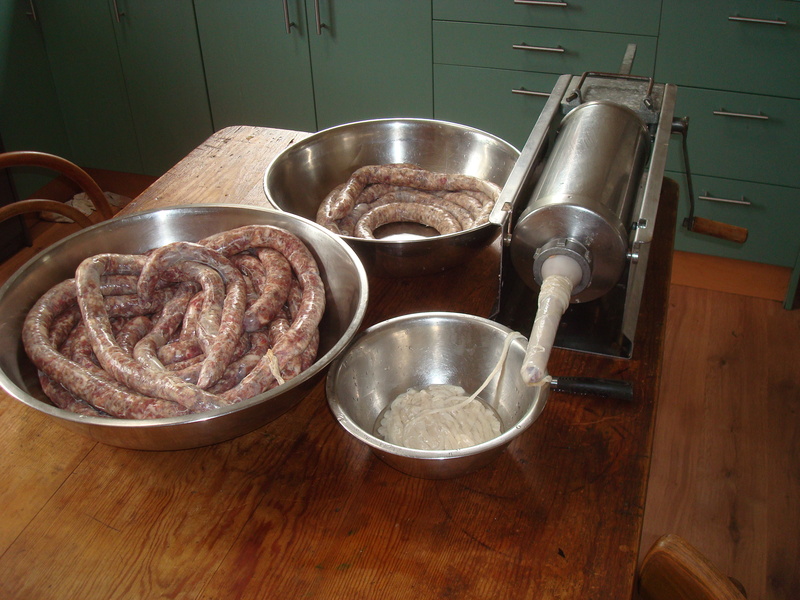 The way I eat sausages, fortunately, allows me many sausage making days during the year. Not having a pig to fatten in the back yard (only because Mrs Back Yard Farmer does not allow me to) means that you need to find and befriend a good butcher in the area as quality ingredients of the correct cut and animal are of utmost importance. This week I made Sacicce di Manzo (Beef Sausages), Salcicce alla Cacciatora (Pork Sausages) and a few Salamini. For dinner on sausage making day, I traditionally serve some spiedini (skewers) using the various types of sausages produced on the day. The picky eaters (grand kids) could not get enough of the skewers so I consider the day a success! All the meat should be without bones. Grind all the meat though the coarse grid on your mincer. Mix well after adding the salt and pepper. Let it rest for 12 hours in the fridge. Grind again and fill the skins. The way to cook these is either on the open fire or in a pan, using one cup of water and one tablespoon of vinegar. I’m curious as to the pharase and what area of Italy it comes from. I studied Italian at both school and Uni (not that I speak much) but it seems to be a dialect that I am guessing might be from the north east? Unfortunately we North Italians cannot claim this, as it is derived from Calabria. Your sausage sounds great – anything home grown and natural!! Lamb sausages are something I did not know until living in Australia for some time, but it is great. Which part of the lamb do you use? As for the lamb? I used all of it! I helped butcher them and we cut neck chops, riblets, rib chops, back chops, shanks, roasts and anything leftover or a bit scrappy was boned and minced. The fat was rendered down into tallow over the period of 1 very smelly week and I’ve made soap from it which makes great laundry soap. The skins are salted and dry, awaiting time for me to scrape them down and turn them into lambswool rugs. We didn’t waste very much although certainly didn’t use it all (first time so we cut ourselves some slack). As long as they are all good quality and preferably organic or home grown, but yes the blend of meats and meat cuts can provide interesting combinations. I am sourcing Kiwi farmers in the area to provide some of the meats – also applied for a hunting licence which will make it interesting.